Abandonment, forgetfulness, exploration of the unusual fascinate me. I dive into these spaces that everyone thinks are empty, I wander there for hours that I class out of time. This is the aim of my art, to conquer those keys of life that people think dead and capture these incredible places with my camera. I wish to make intact this peaceful atmosphere, that the textures, the light which fills these places jump to the eyes of the curious ones with regard to my art. Abandoned?? Can i take it and live there? i bet they didn't see that coming. beautiful art nouveau window! I hope it gets restored. I love this view. Which castle is it and where? Looks like a creepy arm holding something in the window. the images are all breath taking...you can imagine what they were before they turn to ruins..i so love this..
Are these places publicly accessible or do you have to break in? I live in North America and I can't imagine anything like these just chillin where anybody can waltz right in. I'd love to take a trip to shoot places like this. I'd love to take along lights and shoot them as if they were brand new. Some are a bit too easy to access. This past year when I went on vacation in Europe, I would sometimes walk around an uncrowded street off the beaten path, and find unlocked doors to buildings that I thought were open to the public (a shop, church, etc.) 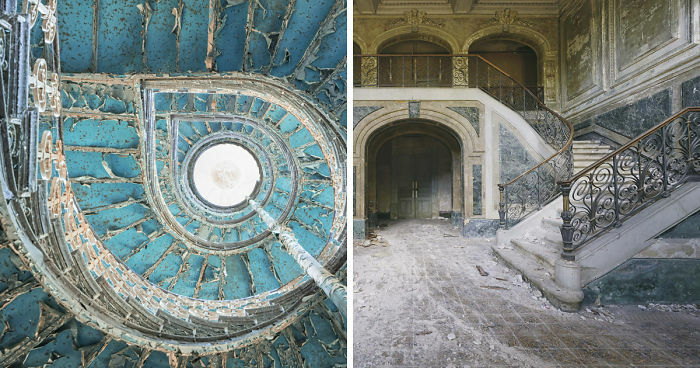 I had a few impressive abandoned places that I walked into, looked around, and realized, "I shouldn't be here." I was tempted to stay in a few for photos, but my prevailing concern was that I am a solo female traveler and no one knows where I am or where to look for me if I fail to turn up. Stunning what great perspective. So sad they are abandoned.